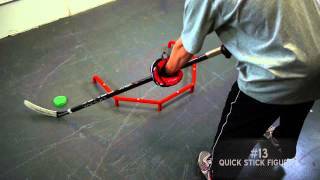 Fast Hands Hockey Stickhandling Training Aid is rated 4.5 out of 5 by 2. Quick hands are something hockey players have to have to keep up with fast pace of the game. 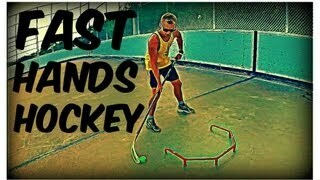 Keep your skills up to par and maybe beyond that with the Fast Hands Stickhandling Training System created by Fast Hands. Built in the United States, this completely powder coated steel tube training system is built to last. Perfect for on or off-ice use, either way you’ll continue to improve all aspects of your stickhandling skills. Fast Hands Training System comes with an instructional video with numerous printable drills that help you continue to grow as a player. Rated 5 out of 5 by Hansen from Harder than it looks Watching videos of this makes it look so easy, but after trying it I realize I have a long way to go! Playing defense all my life, I have never developed soft hands. Now that I am older and playing in leagues where I can skate with the puck more, I realized I had hands of stone. I decided to try this tool, and I can say that if you practice with it, I can see where it will teach you how to be a better stick handler. After about 15 mins trying even the simple exercises I felt I did notice a difference. The first few minutes I kept hearing the "bing" of the puck or my stick hitting the bars. But I kept trying and found I was able to get the first drill down ok. I can see this tool really helping in perfecting stick handling skills. In order to do the drills you have to use proper technique. If your off by even a bit you'll hit one of the posts and lose control of the puck. It is light enough to carry but heavy enough to not slide when hit with a stick or puck. A must for any player wanting to get their skills to the next level. Rated 4 out of 5 by flemsMOM from Good Training Aid - Kids love it I got this for my son (14) for Christmas along with some ice tiles to stick handle in the basement - he loves it to work on drills. My daughter (11) has started using it as well. It's made of solid metal and is quite lightweight which was the only drawback I saw - I thought for the price it would be heavier metal and wouldn't slide around as much but again, it doesn't stop the kids from using it which is all that matters really. What is the overall dimensions of this trainer? I'd like to get an slide pad to put it on. Thanks. The overall dimensions are 30&quot;x 22&quot;. What is the overall weight of this trainer. This weighs approximately 5.5 lbs. 11 inches between each post. And then just under 3 inches or clearance from the ice/ground to the bottom of the bar.